Matt Bell, acclaimed author of Scrapper and In the House upon the Dirt between the Lake and the Woods, in his latest collection brings together new stories along with work from two previously published books, the novella Cataclysm Baby and the story collection How They Were Found. This book opens with the title story, where a boy is locked inside a room with an albino ape. All we know is that this act is carried out by “the man with rough hands” and that the boy sees something behind the man when he opens the door every day to feed the boy and the ape. Over time, the boy changes and doesn’t know or can’t remember what’s beyond the locked room with the ape. This kind of uncertainty occurs throughout the works in this collection, as does the uncanny. Next, “Doll Parts” deals with what we might call unthinkable, the death of a child, and in this case it’s dealt with through the eyes of a child—the sibling left behind. In this story the sister, with a doll made to replace the brother, slowly moves through the mystery of her brother’s disappearance. The third story, “Dredge” is horrific, but not just for the sake of being shocking. Its characters are so fully realized that it feels like they really exist, perhaps in some sadder, scarier reality. After this story, I did, however, have to set the book down to process what I’d read so far. Bell’s stories are—affecting, to say the least. “Wolf Parts” is a reimagining, or more accurately, several reimaginings, of “Little Red Riding Hood,” where the girl and the wolf match “the other’s song note for bloody note.” And that’s just Part I. All around us are reminders of the people and places that were once us, images captured in glass and mirror, the shape of names etched into the bricks. In them we do not look unhappy. Following that is Part III, made up of two moralistic tales dealing with religion and race, the latter of which is chilling given the context of the events of the past few years. Family, as in mother and father and brother and sister and me. Family, as something broken and lost. Fate, as explanation, as probable cause. A Tree or a Person or a Wall is at times almost cruelly dark, but is always inventive, unexpected, and interesting. 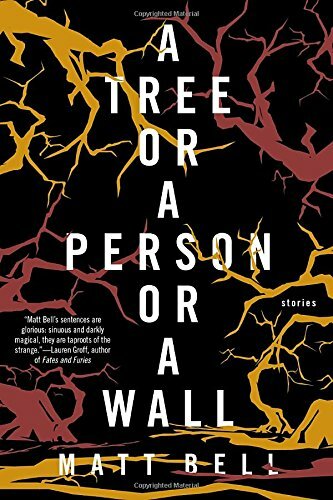 Bell brings together vast, apocalyptic worlds in some pieces and plumbs the depth of characters’ obsessions or anxieties in others. This collection also examines family in a number of extraordinary and sometimes touching ways. There is much here to be explored, and much to be puzzled over, perhaps, but the overall effect of Bell’s work is that it resonates in a number of ways. jmww, a weekly journal of writing publishing the best in fiction, poetry, flash, essays, interviews, and reviews (or a close approximation). Submit your work here!